If you love the look of natural wood siding, but you don't want to deal with the maintenance issues and added expense that comes with wood cladding products, consider using vinyl cedar siding on your home. CertainTeed, one of the nation's leading wall cladding manufacturers, produces a full line of vinyl cedar siding products which are molded from real cedar boards for a truly lifelike match in pattern, grain and texture. Perfection edge means the bottom of each shingle perfectly matches its neighbor. Staggered edge means certain edges stick slightly down or are slightly raised from surrounding shingles -- much as they would if installed individually by hand. Manufacturers also sell mitered inside and outside corner pieces to complete the job. CertainTeed also makes two different rough-split milled shake cladding styles under its Northwoods brand, as well as its premier CedarBoards cladding, an insulated foam product. CedarBoards come in either clapboard, lap or board and batten styles for homeowners who desire a cladding with a wide-board appearance. Mastic siding, a trusted source of cladding products for more than 70 years, also makes a line of four vinyl cedar products. Foundry also is another source for vinyl cedar products. There are many benefits of vinyl siding. Because the cladding is not installed as individual pieces, like real wood shakes and shingles, each product has a much higher wind rating. 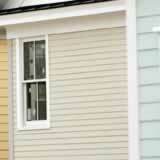 There are 29 different vinyl siding colors to choose from to make it easy to match your home's existing color scheme. Like other vinyl cladding products, these materials come pre-painted from the manufacturer -- you should never have to paint your home again. All it takes to keep them looking new is an occasional high-pressure rinsing with a hose or low-power blast with a pressure washer.